We’re off to see the wizard! Play the best Wizard of Oz Slots and win real money. The Wizard of Oz is the most legendary fantasy story of all. You may have read the Wizard of Oz book, watched the movies, and played the video games already. Or maybe you’ve done none of these things. But I bet you’ve heard of the story and its characters one way or another. 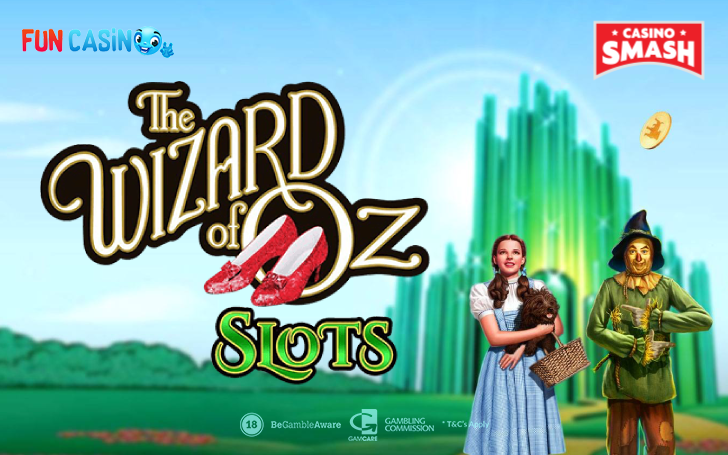 And still, have you played the Wizard of Oz Slots yet? There are dozens of those. Thus, you need to know where to look for the good ones. Especially if you play Slots for real money. Lucky for you, our team at CasinoSmash spent a lot of the time researching all the Wizard of Oz Slots and narrowed them down to the two best Slot machines. WMS Gaming (Scientific Games) developed both of these games. And that speaks of nothing but their quality and brilliance. But those are just words. Play Wizard of Oz Slots and you’ll see it for yourself. What’s the most iconic footwear ever? Don’t you dare to say the Glass slipper when we talk about the Wizard of Oz Slots. Ruby Slippers are the classic symbol of the story, depicted vividly in the movie from 1939, and immortalized in its logo. While not many video games pay that much attention to this symbol, the Wizard of Oz Slots do. That’s why the best Wizard of Oz Slot you can play is called the Wizard of Oz Ruby Slippers. 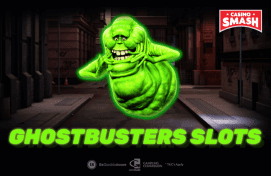 And there is no other video Slot characterizing the movie that well. The symbols of this Slot are the movie characters. 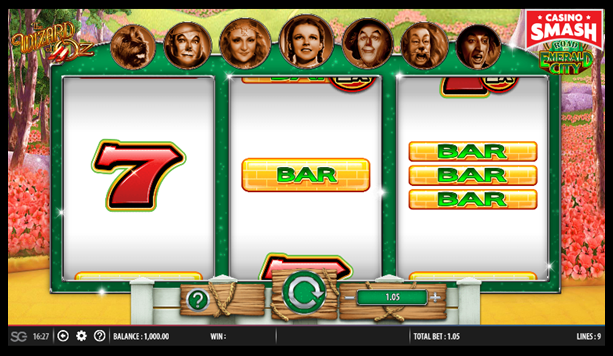 It’s a branded Slot released in 2012, but the characters are depicted exactly as they were in the movie back in 1939. The Slot has a simple five-reel and three-row structure that features the Emerald City in the background. There are 30 paylines in total but you can adjust on how many of them you want to bet. The minimum bet per line is 0.01, the maximum one is 2.00. Thus, essentially you can bet as low as a penny and as high as 60.00 per spin. The Wizard of Oz logo acts as wild symbols and replaces all the symbols except the jackpot and feature-triggering symbols (but about them a bit later)..
Ruby Slippers Feature can be activated randomly. It makes bubbles appear out of thin air and can turn one to four of your reels completely wild. The feature may also trigger 2x or 5x multiplier. If Glinda the Good Witch is on the reels, the multiplier can be up to 10x. Respin Feature is triggered once you have at least one feature-triggering symbol on reels one to four and then the Wizard, Wicked Witch, or the Crystal Ball on the reel five. During the feature, the reels are changing. You get one respin. If any of the feature-triggering symbols appear on the reels again, you get another respin. Find the Broom Feature is another bonus round you can trigger in this Slot. It works similar to the Respin one. To activate it, you need to land two or more feature-triggering symbols on the reels one to four. And the Wicked Witch on the reel five. During the feature, you get a pick-objects round where you need to find the symbol that triggered the feature in the first place. It can be Dorothy herself or one of her friends. Succeeding in this quest can reward you with a multiplier from 4x to 50x total bet! The last one is the Emerald City Free Spins Feature. You activate this feature by landing two or more feature-triggering symbols on the first four reels and the Wizard on the reel five. This way you get five free spins. If it was Dorothy that helped to trigger this feature, you get extra five free spins. If it was the Scarecrow, all Friends symbols (feature-triggering symbols as one) becomes the Scarecrow wilds. If theTin Man was involved, all the wins get multiplied by three (3x). And if it is the Cowardly Lion, one reel each spin turns to the Cowardly Lion wild reel. The Road to Emerald City is the ultimate Wizard of Oz Slot for any classic Slots fan. The Slot is released in 2014 but just like the previous Slot, it’s all about the movie from 1939. The Slot structure is the classic one: three reels and three rows, accompanied by nine paylines. The symbols are a mix between the retro Slots and Wizard of Oz-themed ones. The Slot features 7s and bars as it used to be in the classic Slots. But there’s also Emerald city and the Wizard of Oz logo. The minimum bet is 0.35 while the maximum one reaches 70.00 per spin. The max you can win is 250,000 in coins. What differentiates the game from the usual retro Slots is the number of special features it has. Pretty much every character of the Wizard of Oz story has his/her own feature. To trigger any of them you need to land at least three symbols that have emerald gemstones attached to them. Even during the bonus rounds, you continue to collect the emeralds to trigger other bonus games. Dorothy Free Spins You get between five and 20 free spins for playing. Toto Emerald Trails The reels keep spinning and you keep collecting the emeralds to make three paths for the Toto. Those paths lead to very special cash prizes. Glinda The Good Witch Booster You get a random bonus feature with an extra cash prize. Scarecrow Crow Prizes You get rewarded a random cash prize and/or a multiplier. Tin Man Winning Spin Each emerald collected during the feature increases the multiplier up to 25 times. Cowardly Lion Multipliers Every gem turns the symbol wild and you get a multiplier along with it! Wicked Witch Free Spins Turns the symbols that have attached emeralds to wilds. There’s no place like home. Especially, since you can play Wizard of Oz Slots there. It’s up to you if you play on your personal computer or smartphone. 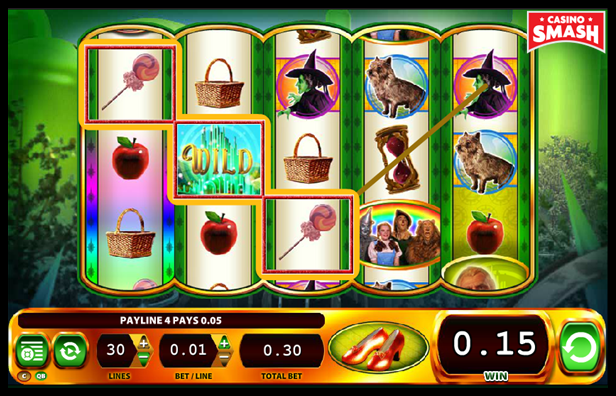 Both of the Wizard of Oz Slots are available on many platforms. And the best thing about these Slots? You can play both of them for free (or for fun). And there’s no need to use cheats for the Wizard of Oz Slots free coins that may eventually get your accounts blocked, or even worse, hacked. Or you can play both of them for real money. And even better, to use a bonus to play for free while still keeping the possibility to win real money. Join FunCasino and get 11 free spins to play some of the best Slots out there. While that doesn’t cover the Wizard of Oz Slots, there’s another bonus that does. 50 percent bonus up to 499 euros for the first deposit. That means you can get up to 499 extra cash, completely for free. 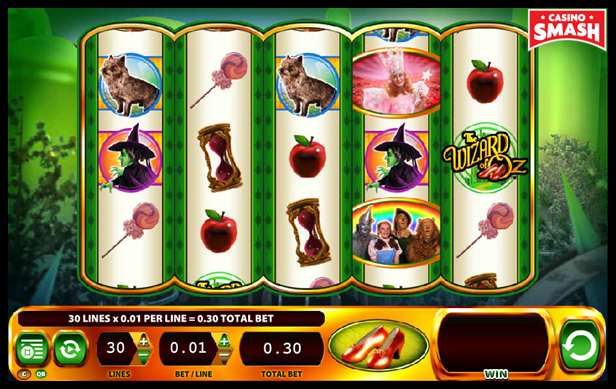 And you can use it to play the Wizard of Oz Slots or any other game FunCasino has to offer. So, what do you say? Let’s go to see the wizard? Bonus info: terms and conditions apply to the offer. If something isn't clear, have a look at our review of Fun Casino for the T&Cs in full. The offer on this article might have expired by the time you read it. Please refer to the review pages for the latest bonuses and promotions available.